Put together by Seven Stories: The National Centre for Children’s Books in Newcastle and Bloomsbury Children’s Books, the spellbinding exhibition will showcase original illustrations, sketches, models and final prints from the brand new edition of J.K. Rowling’s ‘Harry Potter and the Philosopher’s Stone’ all illustrated by Jim Kay. And Hannahs has teamed up with the South Devon Railway to offer a magical round–robin trip as part of these Harry Potter celebrations! Over four Saturdays in July and August (9 & 23 Jul, and 13 & 20 Aug), there’s a chance to enjoy an all–inclusive ticket for a great day out, including a steam train trip, a vintage bus ride and seeing the exhibition. 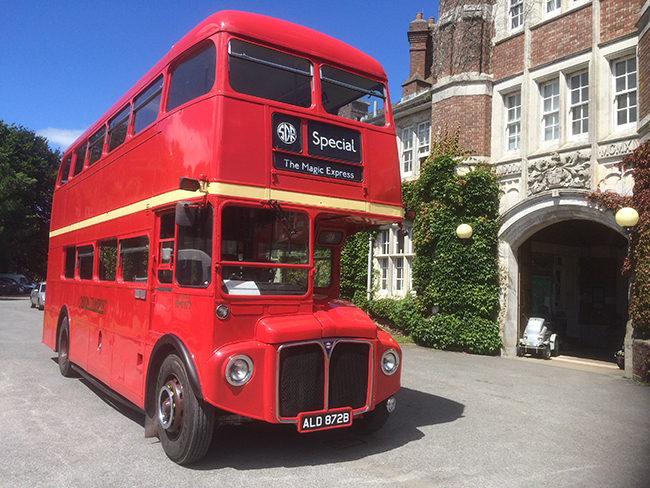 Harry Potter fans can jump on board a heritage train at Buckfastleigh and enjoy a steam train journey on the Magic Express to Totnes; then go on a trip on a former red London Double Decker Bus up to Hannahs; get entry to the exhibition, as well as the Dragon’s Maze and treasure hunt. Then, visitors will be dropped back to Buckfastleigh on the special double-deck bus. People can expect fun and surprises along the way, while wizarding fancy dress is encouraged by visitors. The exhibition will be the inspiration of a whole summer of magical events at Hannahs, including storytelling, astronomy, illustration classes, dinner theatre, cinema and Quidditch lessons (yes it is a real sport!). Visitors will also be able to visit Diagon Alley, recreated from the illustrations in the book. People wishing to travel on the ‘Magic Express’ should park at the SDR's large station car park at Buckfastleigh on the four days of operation and then board the specially reserved carriage at 10.30am for the 10.45 departure, or at 2.00pm. for the 2.15pm train. The morning train passengers will return to Buckfastleigh by bus for 2.00 pm to collect their cars, and the afternoon train passengers will return by bus for 5.30pm. All bookings are being handled by Hannahs and advance booking is essential by either calling (01626) 325800 or by visiting www.discoverhannahs.org/harrypotter (Opens in a new window ). Prices are: Adults £18, Child (Under 10) £15.